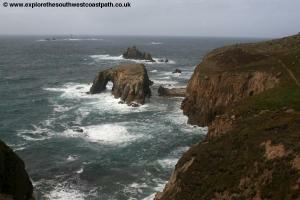 This is a spectacular walk in the far south west of Cornwall, taking in the famous Lands End, the most south-westerly point of mainland Britain. 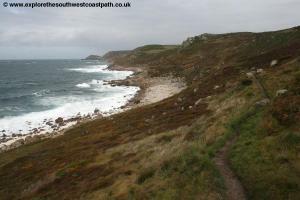 The walk begins at Cape Cornwall and then follows the coast south soon coming to wonderful Whitesand Bay and Sennen Cove, at it's southern end. From here it's a short distance to Lands End and onwards to beautiful Nanjizal. 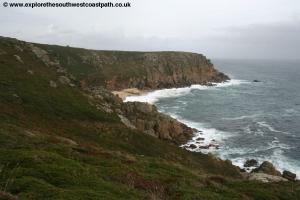 Continuing round the coast we pass Porth Loe, Porthgwarra and Porth Chapel to finish at Porthcurno, home of the Minack Theatre and the first trans-atlantic telephone cables. 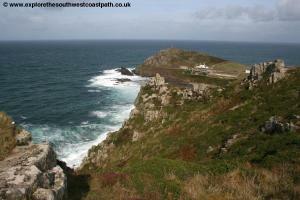 Cape Cornwall is around a mile west of St Just. From the A30 take the A3071 when signed from the roundabout just outside Penzance. Stick to the A3071 all the way to St Just, passing through Newbridge on the way. On entering the main square in St Just (the first of the squares), keep straight on along the main road (Fore Street) into the second square. Here turn left along Cape Cornwall Street. Follow this passing the school and soon leaving St Just. Continue on this now narrow road as it twists and turns soon passing a golf course and club house. 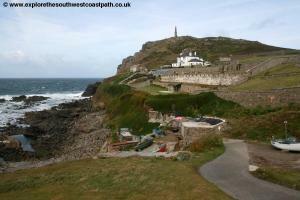 Just beyond this you come to the National Trust car park at Cape Cornwall where you should park. This is a pay on entry car park (although National Trust members can park free of charge). Note however that if you are returning to Cape Cornwall by bus there is no bus service to Cape Cornwall, the nearest place served by bus is St Just and therefore you may prefer to park in St Just and walk along the road to Cape Cornwall. 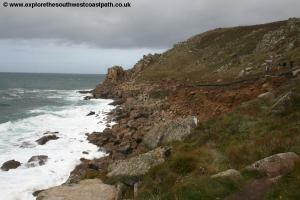 Care is needed as there is no pavement for much of the way although there is generally little traffic since the road only goes to Cape Cornwall. Another alternative outside of the main peak season is to park at Porthcurno and take the bus from there to St Just and then walk down to Cape Cornwall. This avoids the possibly long wait for a bus at the end of the walk and means you can enjoy the walk more without worrying about missing the bus. There is a large pay and display car park on entering Porthcurno and the car park at the telegraph museum is also available to the public (and is also pay and display). Do not park at the Minack theatre at the top of the cliff as this car park is reserved for visitors to the theatre. If you are travelling by public transport, the nearest point you can reach to Cape Cornwall is St Just, which is around a mile away. First Devon and Cornwall service 10 and 10A runs every 30 minutes Monday – Saturday from Penzance to St Just and once every two hours on Sundays. During the summer months First Devon and Cornwall service 300 runs several times daily on a coastal route between Penzance, St Ives, Zennor, St Just, Lands End, Sennen Cove, Porthcurno and back to Penzance. 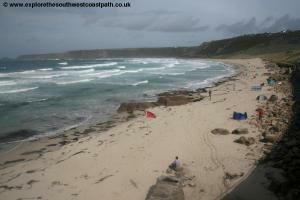 An open top bus is normally used on this service although it serves Porthcurno only during the peak season. 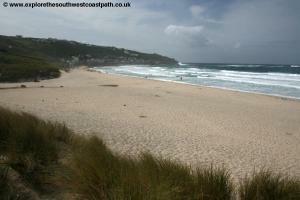 During September although the bus does run it does not serve Porthcurno. In addition Western Greyhound service 507 runs 3-4 times a day (except on Sunday) from the Gurnards Head Hotel to St Just via Morvah and Pendeen. Western Greyhound also operate service 509 which runs 6 times daily (except Sundays) to St Just from Penzance via Grumbla. Finally Western Greyhound also operate the 504 which runs twice per day (except Sundays) between Penzance and St Just via Newlyn, Mousehole, Paul, Sheffield, Lamora, Porthcurno, Lands End and Sennen Cove. For details of public transport to St Just please see the link below. 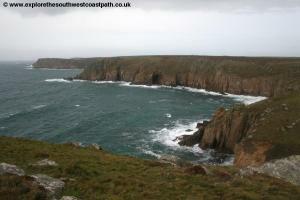 This is a remote part of Cornwall and so accommodation is rather limited. 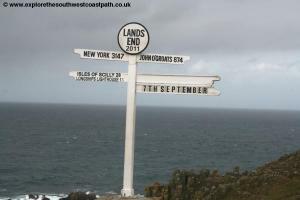 There is a hotel at Lands End, The Lands End Hotel. 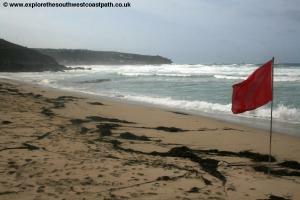 Otherwise if you wish to stay in a hotel you will need to stay in a nearby town such as Penzance or St Ives. However if you prefer to stay closer to the path there are a number of guest houses in St Just as well as self catering cottages and a few campsites. Most of the accommodation is detailed on the Lands End Cornwall Accommodation Providers website which has a list of Bed and Breakfast, self catering and camping accommodation in the area. Cape Cornwall is a lovely spot and was once thought to be the most south westerly point of main land Britain (it is in fact Lands End a few miles to the south). Nevertheless this point has the feeling of remoteness that it perhaps feels more like it should be the end than the usually crowded Lands End. The path doesn't go out onto the little peninsula where the monument is although it's worth taking the walk out here for the views. To begin on the coast path, from the car park head on the road down towards the Cape and after the car park ends take the first road on the left. 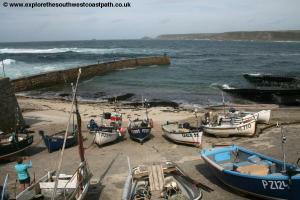 This comes to a junction where the track to the right leads to the little slipway and harbour. Don't take this but instead take the wide path off to the left, heading up hill. As this track forks, take the right most fork with the golf course on your left soon passing a few houses. The path soon widens to a little parking area and turns off a little to the left, heading back inland. Follow this for a few metres and then turn off right onto the signed footpath, leaving the road and following the cliff tops. This soon descends down into the valley of Bosorne where you have to head some distance inland to join the road along the bottom of the valley. Soon you double back, now heading downhill to the road. On reaching the road continue west along the road heading towards the beach at Porth Nanven. This is a rocky beach with some sand at low tide. The coast path doesn't go to the beach itself instead it turns off to the left soon climbing up the other side of the valley. However if you wish to go down to the beach, a steeper path climbs back up to the official route from the small car park at the end if you prefer. 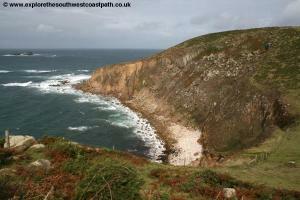 In any case, you soon rejoin the cliff top path that heads south along the cliff edge. 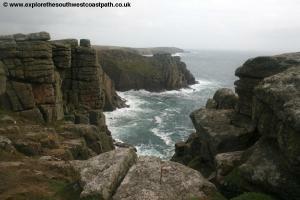 For the next Â¾ of a mile or so you follow the obvious coast path along the cliff top, past some rocky little outcrops in places and have lovely views back to Cape Cornwall. Soon you descend into another little valley and back the other side, along a wider path. Follow this for another mile or so along the cliff top. The path can be awkard with large rocks on the path in places and you follow it until you soon find yourself descending towards a glorious sandy beach. This is Gwynver and has some dunes behind. Despite it's fairly remote location this beach does have lifeguard cover in the summer from the little hut at the back of the beach. 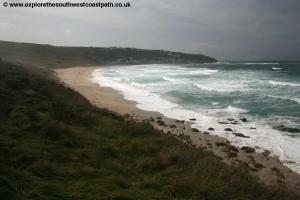 At low tide here it is possible to walk along the lovely beach to Whitesand Bay and Sennen Cove at the far end. 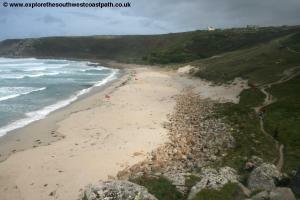 If the tide is higher you'll need to rejoin the coast path as it rounds the back of the beach. Rounding the cliffs you come to Whitesand Bay and can soon make your way down the dunes to walk along the beach if you prefer. 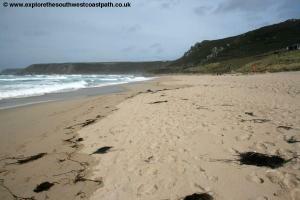 In my opinion this is one of the best beaches in the whole of Cornwall. It's west facing location makes it popular with surfers, as there is nothing between here and America. The dunes at the back also make it a good sun trap and it's a very popular family beach, but it's remote location means it's rarely as crowded as beaches in nearby St Ives or further afield in Newquay. 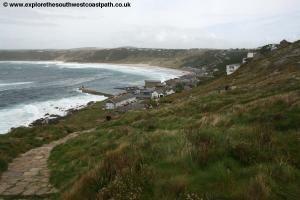 Follow the beach or the coast path through the dunes to the pretty village of Sennen Cove at the south of the bay. Here you join the road passing the couple of pubs and hotel and various shops and takeaways along the sea front. If you wish to cut the walk short here buses run back from the sea front here to St Just. To continue the walk follow the road to the little harbour at the far end of the road and pass through the car park. At the end of the car park turn left along the private parking area of the flats here and at the end take the obvious coast path up steps. This soon turns right and you follow this right out to the point at the end. 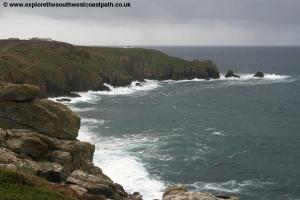 Turn south with the coast here and follow the wide path heading due south to the Lands End complex you can see ahead. 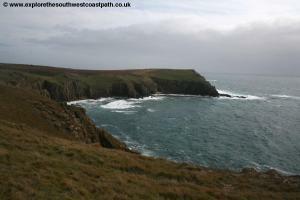 There are lots of paths on the ground here, but just follow any of them due south keeping close to the cliff edge. 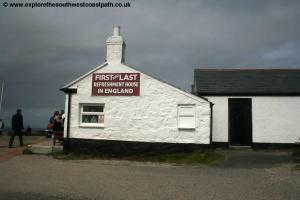 Soon you come to the First and Last refreshment house, a good place to stop for some food. 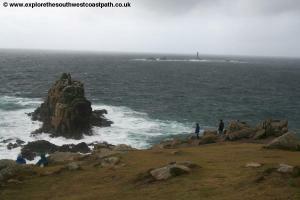 This point is truly the most South Westerly point of mainland England (although the Scilly Isles, 25 miles further west are the most south inhabited point of England, with the Bishop Rock lighthouse being the most south westerly point). From the end of this headland head south on the wide path to the main hotel and entertainment complex. This is best avoided unless you have a desperate urge to purchase souvineers, so instead continue passing the famous sign post, which gives the distance to John O Groats, New York, The Isles of Scilly and of course a place of your choosing (should you pay the required fee!). Keep to the seaward side of the hotel passing the staff car park at the back and keep south on the main coast path. The wide path heads towards some farm buildings along a wide surfaced track and here you head south on the signed path beside the buildings and back to the cliff top. Most of the tourists that crowd Lands End don't make it this far and the path is soon quiet once more. Turn left when you reach the cliff top again, keeping the sea on your right. Look back and you can see the rock known as Armed Knight, with the whole through it. 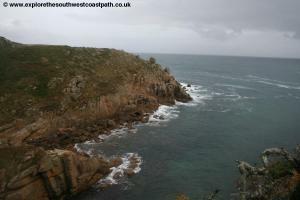 Ahead you round the back of a rocky little inlet and here keep to the path closest to the cliff top. Soon you round the rocky beaches at Zawn Wells and Zawn Trevilley. Soon you round the corner into Mill Bay (or Nanjizal, it has two names on the map). This is a wonderful spot, the shallow waters have white sand underneath them meaning you either have a beautiful azure sea here or better still a glorious sandy beach. Rounding the bay if you look back to the little headland there are numerous caves in it. As you descend there is a lone house on the cliff top and a track near here leads down to the beach. If you have time it is well worth taking the path down to the beach if the tide is out as it's a wonderful remote little beach. 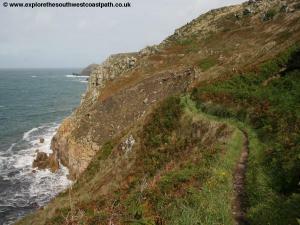 Returning to the coast path, climb the track back up from the beach and soon turn right off the track and onto the signed coast path. 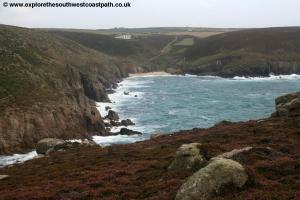 This follows the cliff top round the next little bay of Pendower Coves, although there is no beach this time. 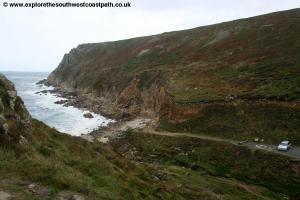 Continue on the obvious cliff path, passing Folly Cove and Porth Loe, the latter a rocky and pebble beach. 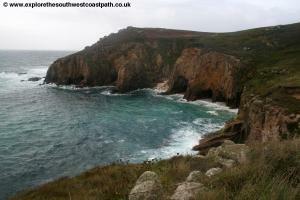 Take the path up from this rocky beach and continue passing the Coast watch station on the cliff top. 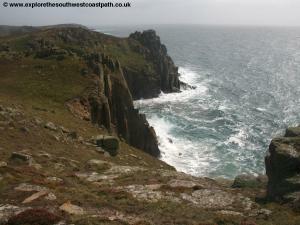 Follow the path round the headland and soon you are descneding to Porthgwarra. This is a charming little village with a lovely sandy beach and a little shop. There are also public toilets in the car park. The beach here is accessed via a little tunnel cut through the rock by tin miners. Pass the shop on your left and then take the track off to the right. 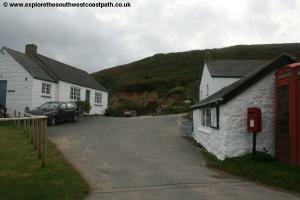 This leads past the other houses and with the terrace of three houses ahead turn to the right on the signed coast path. Follow this path as it passes behind another sandy and rock beach. Keep to the well signed coast path along the cliff top for a little over half a mile to come to another wonderful beach, Porth Chapel beach. 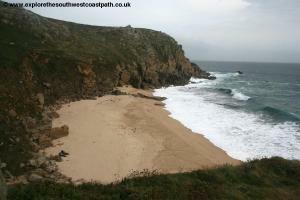 The path descends down to the back of the beach and this is another wonderful and secluded beach you can enjoy. 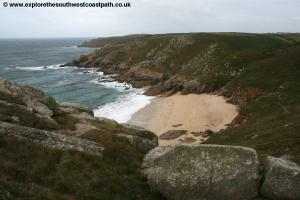 Take the path along the cliffs at the back of the beach, soon climbing away from the beach and rounding the cliff top for around a third of a mile until you come out into the Minack Theatre car park. This wondeful theathre was cut out of the rock and has a wonderful location overlooking Porthcurno beach. If there isn't a production on it is possible to pay a small admission charge and look round (it is not possible to see the theatre from the coast path).Watching a production here is a truly memorable experieance. From the other end of the car park take the path as it winds down the cliff via some steep steps to the wonderful beach at Porthcurno. The beach here is made up of a slightly coarse white sand made up from many broken shells and is is usually sheltered from the westerly winds. At low tide it is possible to walk around the base of the cliffs to the next beach and even round to the wider Treen cliff with it's lovely beach. 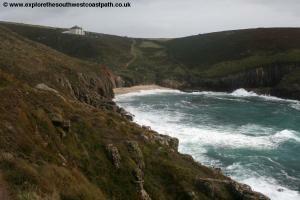 Be careful though as it's possible to get cut off by the tide (although there is a steep path back up from Treen beach). The walk ends here at Porthcurno. Porthcurno is also famous from a communications point of view since the first transatlantic telegraph cables came to shore here and the telegraph museum back up in the village tells their story. To get to the bus stop, follow the wide sandy path up from the beach to come to the main car park. The buses leave from the bus stop just by the entrance road to this car park (and the entrance road into the neighbouring Telegraph museum). 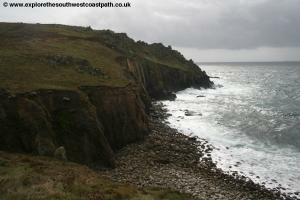 Getting back to Cape Cornwall can be something of a challenge, depending on the time of the year. During the peak summer months First Devon and Cornwall service 300 runs several times a day direct from Porthcurno back to St Just from where you'll then need to follow the road back to Cape Cornwall (see directions below). In addition Western Greyhound service 504 runs Monday – Saturday all year round from Porthcurno to St Just although the bus only runs twice per day in each direction. 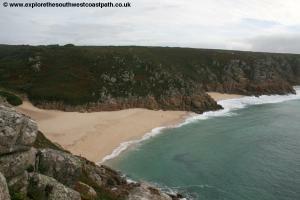 If you are walking this route when the 300 bus does not run it is recommended to park at Porthcurno in the morning when you can take the morning bus to St Just and then walk back. If either of the above buses are not suitable there is another option, but you will have to travel via Penzance. This is to take First Devon and Cornwall service 1 or 1A which runs 4 times a day (except on Sundays) to Penzance and from Penzance change onto First Devon and Cornwall service 10 back to St Just which runs every 30 minutes Monday – Saturday and once every two hours on Sundays. For details of these buses, see the link below.